As we fast approach the 15th anniversary of the worst attack on American soil, the Pop Culture Uncovered team decided to take a moment to think about how the events of that day changed the landscape of the geek world, and our respective fandoms. Comics (by Adam): Have comics been “permanently” altered by 9/11? Maybe only insofar as any change in comics is permanent. It’s a pop-culture medium, so it’s always moving with the culture. I do know that comics were at least temporarily altered by the attacks, as the industry, like the rest of America, tried to figure out how to react. So much of comicdom has revolved around New York, so it’s unsurprising that comics took it personally. Within days, Mike Deodato posted an iconic image of Captain America weeping over a devastated New York. Other artists followed suit. The various publishers eventually published books telling stories about how they felt: some angry, some scared, but many hopeful. Marvel released a pin-up book reflecting various artists’ interpretations of the event, and an additional anthology book, A Moment of Silence. DC and Dark Horse jointly published collections of reflective 9/11 short stories, while Alternative Comics published its own similar effort. If the attacks affected comic fandom at all, it may be that it briefly reminded us that superheroes really are in the world of fiction. In the comics and the movies, a mass attack like that would instantly lead to hundreds of heroes rushing to the rescue, saving everyone. In real life, we watched buildings burn. Real-world heroes did run to the rescue, but no grand hero in a cape saved the thousands who died that day. I think the industry tried to comprehend this in the infamous 9/11 issue of Amazing Spider-Man, in which Spidey had his own reaction to the attacks. In a “realistic” Marvel Universe, the attacks would have never happened, yet somehow, at Marvel, they did. It’s a frustrating issue to read in that regard, but maybe it’s also evocative of the fact that we were helpless to stop it in the real world as well. But maybe that collective helplessness was enough to inspire people to become heroes after the fact. In the aftermath of the attacks, people stepped up in real ways by donating blood, money, and time to relief efforts. In the years after 9/11, thousands joined the military, or became police, firefighters, or other types of first responders. 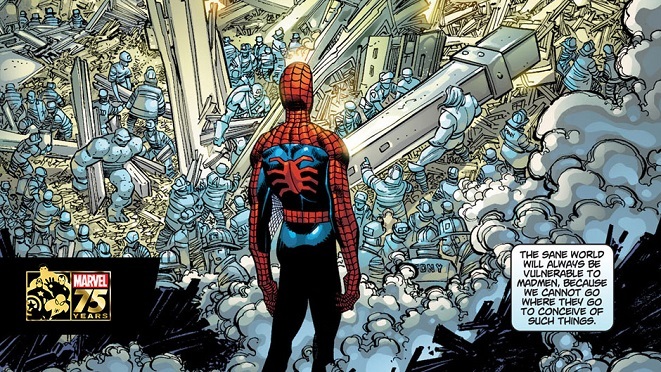 When heroes don’t come, maybe you have to learn to be the hero, and 9/11 was the wake-up call that we can’t always be in the fantasy world of comics. In gaming, the effects from 9/11 have been mixed – some fairly stark, and others relatively subtle. There were actually several games which were changed or delayed at the last minute, due to references to the World Trade Center, the term “ground zero”, or even just references to terrorism. Most Americans are very aware that there was a definite spirit of nationalism that the United States experienced following the events of the 9/11 attacks. That nationalistic feeling was spotlighted & actually challenged (in a way) by the dystopian storyline in Bioshock Infinite, in order to point out the fallacy in blindly following leaders who promote such a dogma. Now, who can forget the infamous airport shootout scene in Call of Duty: Modern Warfare 2? It was controversial as players were actually allowed to play the antagonists. While players didn’t necessarily have to shoot the hostages, or could choose to skip the level entirely, having that option made that scene even more controversial. To be honest, as a gamer, I found the scene disturbing as I don’t think I ever previously played a game that let you viscerally kill innocents like you could here. Another issue that has recently arisen, is that gaming consoles have become multimedia devices which allow people to communicate from almost anywhere. This has elicited concerns from many governments, because it has been found that, in the last few years, terrorist organizations are allegedly using gaming systems‘ chat features to communicate with their cells worldwide. This is being done because apparently, communications in gaming systems are hard to monitor. As countries like the US put laws like the Patriot Act in place, could gamers one day become concerned that the government is listening in on their gaming conversation? Could we also find out that they are the reason that they are sandbagging us in Battlefield is because they are camping in our spawn spots? The events of September 11th, 2001 certainly had an effect on the world as a whole. In our own fandoms, though, it seems that we are reminded of it on a regular basis. Therefore, on this 15th anniversary of that tragic day, we here at PCU want to remind you all, dear readers, to never lose hope, rejoice in your respective geekery, and enjoy the beauty in everything we have.